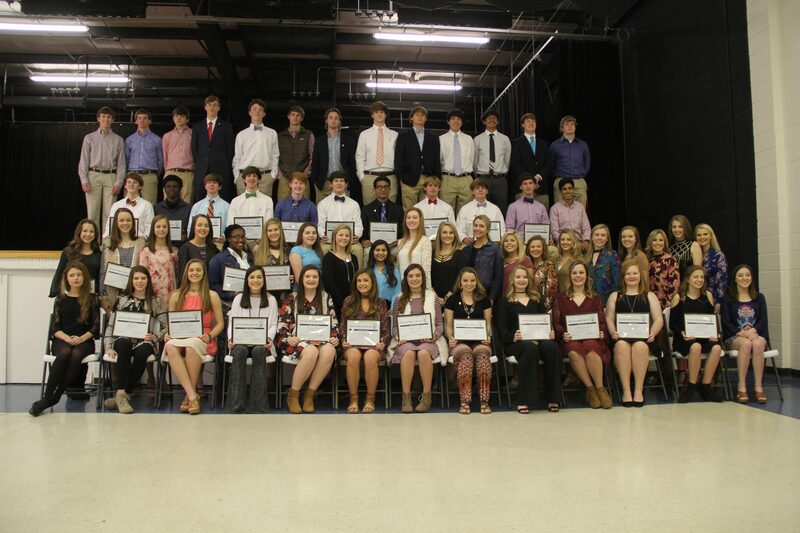 The Westwood National Honor Society recently hosted the 2017 Initiation Ceremony. New initiates were invited to apply because of high academic achievement. Applications were evaluated by the Faculty Council and students who met the characteristics of leadership, scholarship, character, and service. This year’s initiates include: (L-R Back Row) John Dean Daniels, Jonte Harris, Dawson Brinkley, Ivey Davis, Spence Cranford, Gambill Dallas, Jay Patel, Zach Howell, Will Hatcher, Tyler Harris. (Middle Row) Lauren Allen, Lori Bentley, La’Donna Harris, Leann Bentley, Loren Wray, Cassidy Trebony, Camilla Greene. (Front Row) Abby Santis, Gracie Pollock, Lucy Simmons, Darrah Butler, Isabella Bowden, Abby Kennedy, Ivana Santiago, Erin Smith, Sydney Singleton. Congratulations members of National Honor Society. Here’s a photograph of all NHS Members 2017. We’re proud to have so many high achieving students at Westwood. NHS new initiates and all current members of NHS.